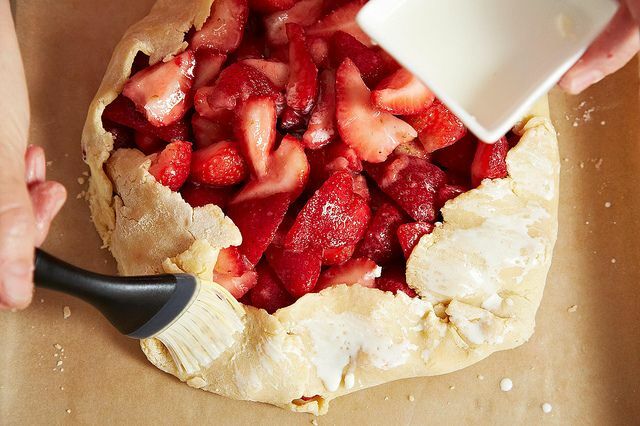 Today: With these 7 steps, you won't need a recipe to make rustic, free-form fruit tarts -- through summer and beyond. A galette is a rustic tart with hand-folded edges. The first one I made was apricot and involved an elaborate mixture of ground nuts and apricot kernels sprinkled under the fruit and was out of this world. But afterwards I thought to myself: what happens when the apricots are gone? What else can I put on top? Can't I make it even a little more rustic? The dough is so simple, so flaky, so versatile. Since then, I've basically put every fruit and a lot of vegetables you can think of on top to make both sweet and savory galettes. The small amount of effort it takes to get ga-ga reactions out of dinner guests is incredible. If the fruit you're using is particularly juicy, you may want to experiment with sprinkling some insurance onto the dough before arranging the fruit so that the bottom doesn't get soggy. I've used all different combinations of hazelnut flour, pecan flour, brown sugar, turbinado sugar, shredded coconut, you name it -- just a couple tablespoons of anything you think might soak up fruit juice and taste good. One important thing to keep in mind is that toppings lower in moisture (like raspberries, goat cheese, figs -- things that can't take 45 to 60 minutes at 400° F) should be added on partway through baking instead of from the beginning. My personal favorites have been apricot, seckel pear, Italian prune plum (absolutely gorgeous, cut in halves and laid open face up), and savory ones with potato and goat cheese. Let your imagination run wild! 1) Heat the oven to 400° F (if you have one, place a pizza stone on a low rack). 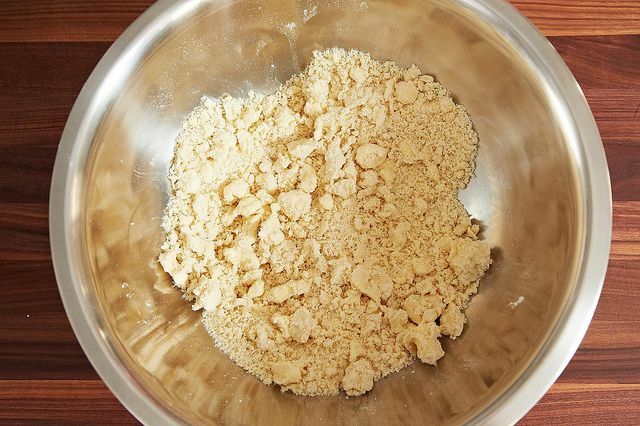 Cut cold, cubed butter into your flour using a pastry cutter, two knives, or your fingers (the ratio I use from Chez Panisse Fruit is 2 cups flour -- with a pinch of salt and a tablespoon of sugar -- to 1 1/2 sticks of butter). 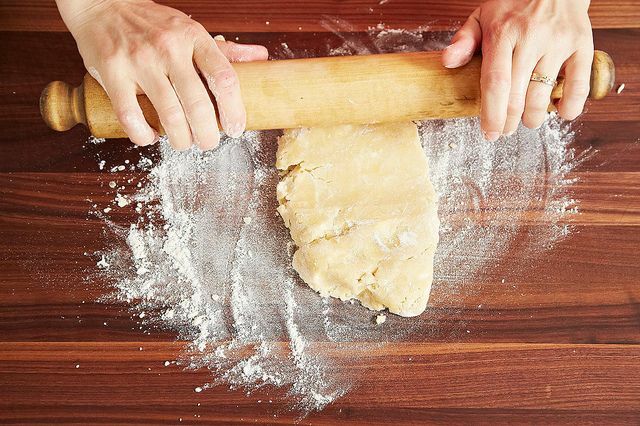 If you use your hands, work fast; airy texture of the baked dough really benefits from cold butter pockets steaming during baking, so try to keep it cold! It's really okay if it looks hodgepodge here -- the largest pieces of butter should be about the size of a pea. 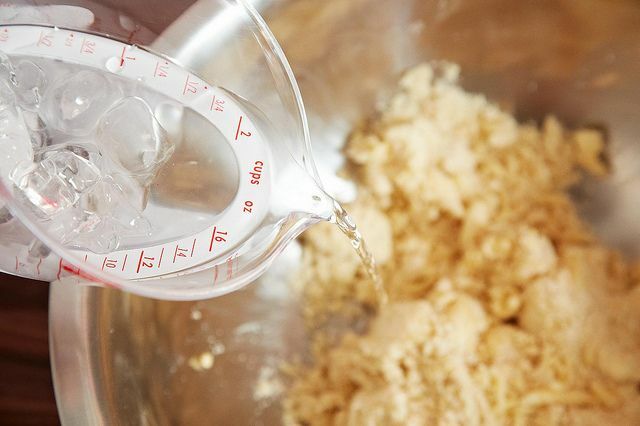 2) Sprinkle ice cold water across the dough and shake the bowl to distribute. Usually I dive my hand in here very briefly to mix in the driest patches. It's not necessary for the dough to be uniformly wet at this point, though, since the moisture will spread during resting time in the fridge and while it's getting rolled out. 4) While the dough is chilling, prep the fruit (or veg, or whatever is going on top), taking care not to let things oxidize too much in the meantime -- apples and pears will go dark on you if they sit too long, but lemon juice can combat that. After much experimenting, my preferred composition is wedge slices arranged in concentric fans -- they hold moisture well, and look the nicest after baking. 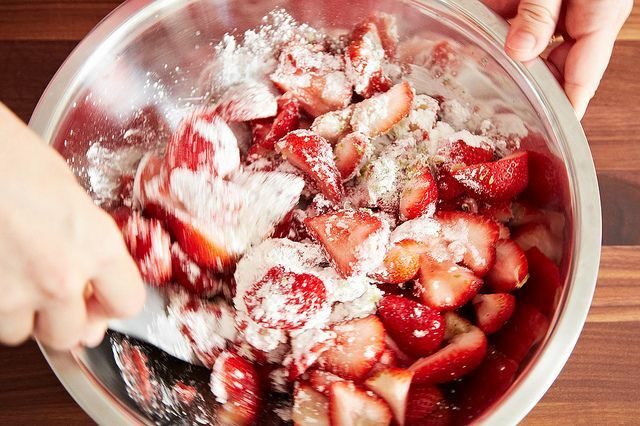 With smaller, juicier fruit like summer berries, you can just toss with a couple spoonfuls of sugar and a thickener like flour, cornstarch, arrowroot, tapioca flour, etc. 5) Roll out your dough. I like a roughly 12-inch diameter circle-ish shape, about 1/8-inch thick. I use a knife to slice off errant blobs and roll them back into patches where they're needed. 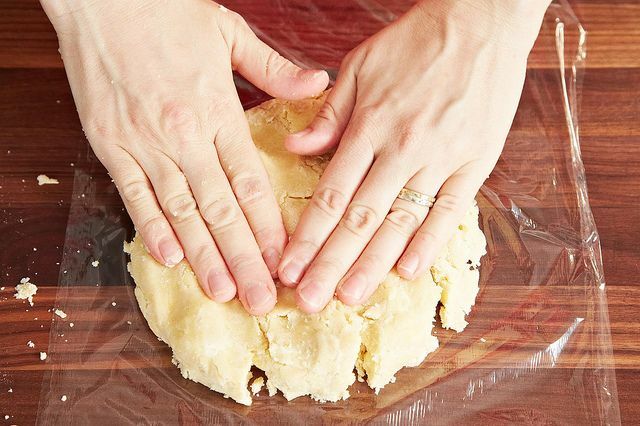 Take care not to roll too much, since those butter pieces need to remain intact in order for the dough to stay light and flaky. 7) Brush melted butter, cream, milk, or beaten egg thinned with water on the crust edges. Sprinkle sugar on the edge (I know it seems like a lot of sugar, but don't skip this part). Place in middle rack for about 45 minutes, possibly more depending on how caramelized you want things. You can rotate halfway through; keep an eye on it to see how it's going, sometimes different edges brown more than others and you don't want them to start burning before the rest is done. When it's done, lift the parchment paper with the galette onto a cooling rack. Wiggle the galette loose from the paper (it's hot, careful!) and gently pull parchment paper out while sliding galette to stay on cooling rack. This is important because it helps air out the underside, which can get soggy. Wait as long as you can until cutting the first slice, and enjoy! It's also really, really good the next morning for breakfast. We had a breach in the edges on this one and some juices escaped, and that's okay! Just remember: rustic, rustic, rustic. We're looking for contributors! Email [email protected] and tell us the dish you could make in your sleep, without a recipe. Devoted farmer's market shopper. Hatching plan to study apiculture and cheesemaking ("bees 'n cheese") in Italy. Cooking on and off the line. Jo Ann, my pizza stone "lives" in the oven on the bottom rack - it's just too heavy to move, so I assemble everything on the parchment, move it to the peel, and use the peel to place it on the stone. If yours is lighter weight or you don't keep it in the oven all the time, you can move it to the middle rack. Hi, Jo Ann-- I just leave the pizza stone on the bottom rack of the oven during preheating; having it in there helps keep the oven temperature high and even during baking. I do *not* bake the galette on a sheet tray directly on top of the stone because it can dry out and scorch depending on how dry the ingredients already are. I bake the galette on a separate oven rack in the middle of the oven. Being the laziest cook in the world, I will be using prepared pie crust. Hello , I'm from Australia . Can't wait to make the galette but do not understand 11/2 sticks of butter . We weight in grams / kg. Please help ???? Margaret, one stick of butter (half a cup) equals 113.4 grams. Quick question. You say with fillings that can't take the heat for that long to add them in partway through baking. Can you please explain how you do this? Hi, Jennifer! 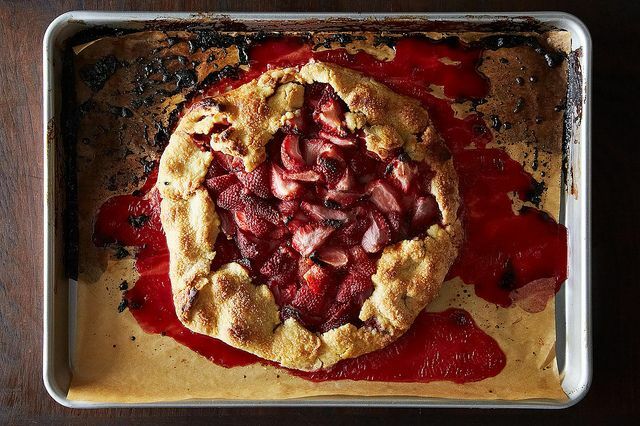 Just take out the galette, pop on whatever you want, and place it back in the oven. mmm yum!! how'd it turn out? i cannot wait for stone fruit season! I've been thinking of making a sour cherry custard galette, using the custard as "insurance". Does anyone have a custard filling recipe that might work? I don't have a recipe, but would just suggest you cook the cherries enough to release their juices, drain and cook the juices down to a syrup, add back the cherries and whatever seasonings you like with them (cinnamon? cardamom? a little brown sugar?) and go from there. Hi ana-- That sounds great! If you're up for a pastry cream, the for "Honey Pear Galette" at kokocooks.com looks delish and like it worked out well. Otherwise, I've found many other examples for "galette" and "custard" searched together online. Would love to hear how it works out! haha that's great. so many possibilities... also reminds me of the pretzel pie crust i tested. these things can turn out surprisingly well! that does sound amazing! mmmm... i've been meaning to try making creme fraiche at home, sounds pretty easy (just found adrianna's "small batch" post with instructions). have you tried it with either? I've only made galette once and it was a 5 on a scale of 1-10... This recipe has rejuvenated my interest and might be the next thing my kitchen turns out! Thanks for sharing! i don't remember exactly what i did to the potatoes, but you could slice thin rounds and lay them flat on the dough, maybe some pesto or whatever you have underneath (remember, exposed pesto/goat cheese/etc will dry out so if you want it on top then add it later). i don't think the potatoes would need to be cooked... 45+min at 400F should do the job. curious to know how it goes! also, if you're doing savory, may be a good idea to spray/brush things with some olive oil before they go in. sort of the equivalent of adding sugar on top of fruit. Just got the first 4 quarts of June bearing strawberries today. Wonder what I'm going to do with a couple of serious handfuls. Wow! Tis the season of the galette. I just made boysenberry with fresh picked boysenberry. Spread a bit of homemade blackberry peach jam on bottom, filled with boysenberries (sugar, lemon & flour to thicken) fold crust,sprinkle all with sugar and bake. Smells Wonderful & will make great ending to today's Father's Day dinner with a scoop of vanilla bean ice cream on side. Last week made a peach galette w/ raspberry jam pon bottom. If you spread a bit of jam on bottom, you don't have to use as much sugar on fruit & help with thickening. Crust I have been using also has ground almonds in it. Yum. oooh i wish i could get fresh boysenberries around here... sounds delightful. i've never tried spreading jam on the bottom, only on top when it comes out of the oven (apricot jam on almost any fruit, nice and glossy mmm). great idea! sprinkling all with sugar gives really nice results; i usually use 1/4 to 1/2c on top right before it goes in the oven. i couldn't see my dad today but i promised to bring him a galette next weekend :) hope you're enjoying the day! I've made this a least a hundred times in various forms. My two favorite are blueberries with a hint of fresh lavender - and what I call a BLT - tomato and pancetta filling (you have to cut and drain the tomatoes overnight with a weight) and served with an arugula salad. lavender, great idea! i have a bag of french lavender i've been trying to think of things to do with. how do you use it? thanks for inspiration! Love the idea of fresh lavender. Got lots of that in the garden! did you just use strawberries in the one above? that one was done in the central kitchen, so i'm not sure... looks like strawberries and a thickener? rhubarb would be great to add while it's still in season! This is great, since summer fruit is beginning to come in in abundance (at least, here in California it is - you should see the strawberries and peaches I got at the farmers market yesterday!). 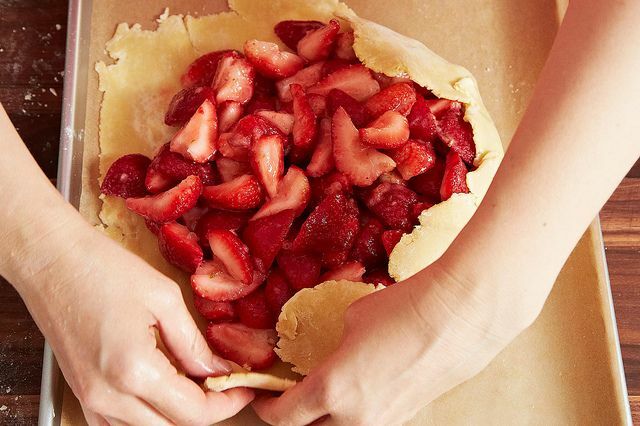 So does your dough recipe make one galette or two? It's a little confusing, because the recipe says to pat the dough into one or two discs before refrigerating to rest, depending on how many galettes you want to make. Thanks! good question, thanks for asking. if you do the quantities mentioned in the ratio, it will give you enough dough for 2 galettes. i always split in half, rest both, and either make two at once or the other one not that long after. the dough can rest in the fridge for at least a few days; it may develop tiny brown dots, but not to worry. still good to use. yours sound like they will turn out great! Thank you, Rebecca! I Googled "moondust" and found at a number of sites that the dough recipe (essentially a pate brisee) is one Jacques Pepin created at Chez Panisse many years ago - culinary history is so interesting, isn't it? i think maybe i had read that at some point about jacques pepin, but i had forgotten! i saw him do a demo once of simple kitchen techniques... it was even amazing just to watch him peel vegetables. Mmmmm. 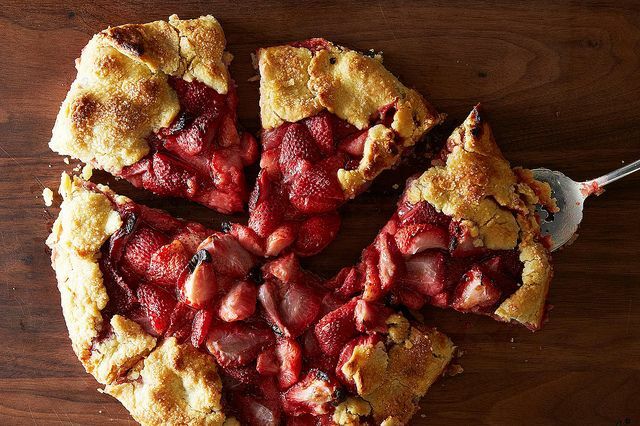 I will make this with beautiful Michigan strawberries and a little rhubarb in season now. i was just reading a strawberry a rhubarb version! sounds delicious! chez panisse moondust was in that first galette i mentioned at the top of the article, but it's a lot of work-- and obviously requires a recipe! you can still use noyaux (the kernel inside a stone fruit pit) in your insurance dusting under the fruit even without making amaretti first. so for anyone who doesn't throw away the pits and wants to add that soft, wonderful, bitter flavor to a stone fruit galette, i recently discovered two things: 1) even really dried-out noyaux will rehydrate beautifully in a glass of tapwater set someplace warm like a sunny window, and 2) choking up all the way to the neck of the hammer allows you to crack open a dried-out pit in one small swing. so i recommend letting those pits dry out all the way and then rehydrating! amanda wrote a great article on stone fruit kernels for the nyt a while ago, you can google that or "moondust" for more information. and the usual caveat: don't eat the kernels raw. i toast them in the pan until medium brown, but if you're not familiar with noyaux just read a little first and see what suits you.